Atlanta is the largest city in Georgia and also the capital of the Peach State. This is not a sleepy little town, because Atlanta has an economy that is ranked eighth in the nation. Companies such as Coca-Cola, Delta Airlines, and UPS have their headquarters in Atlanta. This is a major American city. Information technology has replaced cotton as a source of jobs. Indeed, Atlanta is referred to as the Silicon Peach because of its commitment to technology. It has an educated workforce, which is good because it allows Atlanta to have superior intellectual capital. It also has urban challenges which could be helped with a group legal plan. Even though the people are friendly and are known for hospitality, there still are disputes that arise. Small claims courts are a place that is used for these disputes. There also may be some problems with warranties, and folks don't always get what they think they are buying. Pre-paid legal services include help with small claims court cases and dealing with bad warranties. These are reasons why a legal service can be very important. An estate settlement can be confusing if there is no will, and another good benefit is the drafting of wills. Countrywide Pre- Paid Legal Services provides the kind of support a hard-working employee in the Gate City can use. Anyone who works in technology knows the danger hackers post to financial wellness. Countrywide has legal benefits such as credit monitoring and ID theft protection to guard private records. An individual may want to dispute his or her property taxes as a means of protecting financial wellness. Countrywide attorneys will help an individual navigate through the city bureaucracy, and also help with completing lengthy applications. Our network of attorneys is nationwide and there are a number of attorneys in the Atlanta metropolitan area. These people are committed to providing good service to Countrywide plan members. The pre-paid legal services provided in any plan will be administered with both efficiency and courtesy. When we say those benefits in the plan, we mean that choice is part of the process. Countrywide Pre-Paid Legal Services has worked with organizations since 1987, and we respect the unique qualities of each. A given employer may want certain things in the plan document. This is not a problem at all for us. When we are talking about benefits in the plan, we mean that there's an element of choice. Countrywide has worked with organizations since 1987, and we know there are a lot of differences in the various groups. A given client may want only certain pre-paid legal services in a group legal plan. We respect that decision. Those options in a Countrywide plan document are ones decided upon by the client. We provide the high-quality service they expect. We also have a financial wellness benefit for prospective clients to think about. 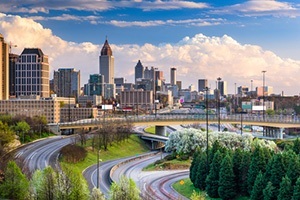 Atlanta does have a high cost of living, and sometimes a good budget is going to help with an employee’s financial wellness situation. This is a city that has a highly educated population, and college graduates run into college debt problems. A financial wellness counselor from Countrywide could be a very important friend. Credit cards can become a disaster if they are not properly managed. With a little bit of help from our professionals, any employee can better manage and control his or her money. As with the group legal plan, whatever options a client wants are what will be in the document. You can find a lot of career opportunity in Atlanta, and employers offer some excellent positions. The same employers should provide a group legal plan or financial wellness plan to better assist their employees. It helps instill a sense of loyalty on the part of those hard-working people. Countrywide would welcome an opportunity to further explain either benefit to an Atlanta employer. We welcome any inquiries and assure you all questions will be answered completely.